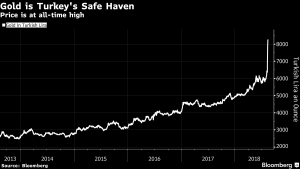 (Bloomberg) — Gold may be trading at its lowest in 18 months in dollar terms but look at the precious metal in other currencies and you can see it’s still serving its role as a safe-haven asset. Take Turkey, one of the world’s largest buyers of the precious metal and home to the ancient kingdom of Lydia, where the earliest known gold coinage originated in the 7th century B.C. Gold in Turkish lira has climbed 30 percent since Aug. 7 as the country’s currency tumbled amid the economic turmoil compounded by a stand-off between President Recep Tayyip Erdogan and Donald Trump. Turn back the clock a few months, when political uncertainty wracked Europe with elections in Italy, Spain and Germany, and gold gained in euro terms in May, even as the dollar price fell. So, adjust your currency to where the crisis is taking place, and gold remains a holder of value in troubled times.